Guidelines for Reporting Health Research is a practical guide to choosing and correctly applying the appropriate guidelines when reporting health research to ensure clear, transparent, and useful reports. This new title begins with an introduction to reporting guidelines and an overview of the importance of transparent reporting, the characteristics of good guidelines, and how to use reporting guidelines effectively in reporting health research. This hands-on manual also describes over a dozen internationally recognised published guidelines such as CONSORT, STROBE, PRISMA and STARD in a clear and easy to understand format. It aims to help researchers choose and use the correct guidelines for reporting their research, and to produce more completely and transparently reported papers which will help to ensure reports are more useful and are not misleading. 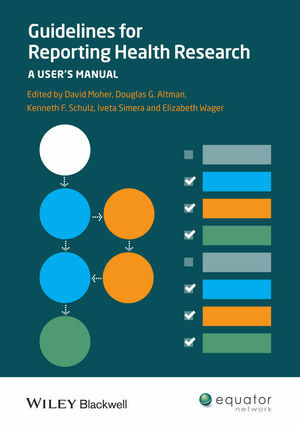 Written by the authors of health research reporting guidelines, in association with the EQUATOR (Enhancing the QUAlity and Transparency Of health Research) Network, Guidelines for Reporting Health Research is a helpful guide to producing publishable research. It will be a valuable resource for researchers in their role as authors and also an important reference for editors and peer reviewers. Matthias Egger is professor of epidemiology and public health at the University of Bern in Switzerland, as well as professor of clinical epidemiology at the University of Bristol in the United Kingdom. George Davey-Smith is the editor of Systematic Reviews in Health Care: Meta-Analysis in Context, 2nd Edition, published by Wiley. Douglas G. Altman, Centre for Statistics in Medicine, University of Oxford and EQUATOR Network, Oxford, UK.